^ Stephen Lucas and Martin Medhurst (December 15, 1999). 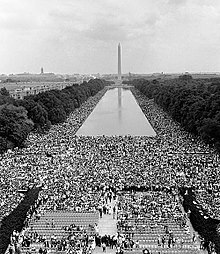 "I Have a Dream Speech Leads Top 100 Speeches of the Century". University of Wisconsin–Madison. Retrieved 18 July 2006. ^ "Interview With Martin Luther King III". CNN. August 22, 2003. Retrieved 15 January 2007. ^ Norris, Michele (August 28, 2013). "For King's Adviser, Fulfilling The Dream 'Cannot Wait'". NPR. Retrieved 29 August 2018. ^ "Jones, Clarence Benjamin (1931– )". 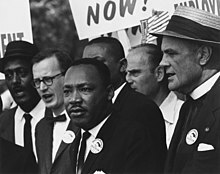 Martin Luther King Jr. and the Global Freedom Struggle (Stanford University). Archived from the original on June 6, 2008. Retrieved 28 February 2011. ^ Jones, Clarence B. (January 16, 2011). "On Martin Luther King Day, remembering the first draft of 'I Have a Dream'". The Washington Post. Retrieved 28 February 2011. ^ "A "Dream" Remembered". NewsHour. August 28, 2003. Retrieved 19 July 2006. ^ John, Derek (August 28, 2013). 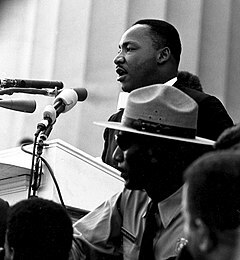 "Long lost civil rights speech helped inspire King's dream". WBEZ. Archived from the original on January 1, 2014. Retrieved 28 August 2017. ^ "Psalm 30:5". King James Version of the Bible. Retrieved 13 August 2015. ^ "Isaiah 40:4–5". King James Version of the Bible. Retrieved 13 January 2010. ^ "Amos 5:24". King James Version of the Bible. Retrieved 29 August 2013. ^ "Martin Luther King". The Nobel Foundation. 1964. Retrieved 20 April 2007. ^ "We Shall Overcome, Historic Places of the Civil Rights Movement: Lincoln Memorial". U.S. National Park Service. Retrieved 15 January 2007. ^ Miller, Zeke J (August 28, 2013). "In Commemorative MLK Speech, President Obama Recalls His Own 2008 Dream". Time. Retrieved 1 September 2013. ^ "Your Record". Science Friday. October 7, 2016. Retrieved 7 October 2016. ^ Strauss, Valerie. "'I Have a Dream' speech still private property". The Washington Post. Retrieved 28 August 2013. ^ Brinkley, Douglas (August 28, 2003). "Guardian of The Dream". Time. Retrieved 28 August 2013. This page was last edited on 10 April 2019, at 01:04 (UTC).